2- You hear a clicking noise. 3- Bringing the car to a stop takes more time than it used to. 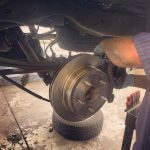 This problem has a name and that name is “brake fade.” More often than not, it’s the direct result of intentionally applying the brakes over a vast distance without bringing the car to a full stop. By forcing the pads to make contact with the rotors for a long, uninterrupted period, both components will heat up. In the process, their ability to generate needed friction against each other is reduced over time. As a result, you’ll find that your car won’t come to a complete stop as rapidly as it once did. 4- The nose of your car pulls to one side when you brake. 5- The brake pedal vibrates when pressed.